My first beer review from SoMe Brewing Company. I met Dave (the younger) there just prior to him opening and sampled all four of his offerings. Brought home a growler of this and a howler of his double IPA. 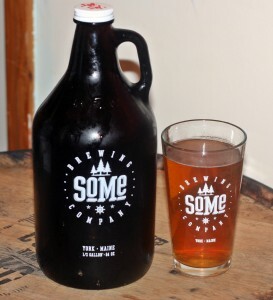 Sweet Solstice is Dave’s take on a holiday beer, good for the season and low in alcohol so you can bring to a party and still be able to drive home. This was an interesting beer with a nice light orange color. Minimal to no head and carbonation was light. Plenty of sweet spiciness in the aroma. Taste follows with the same clove spice that you get in the aroma. This beer is also quite sweet and not bitter at all. Not really my style of beer but I bought this to bring to a family Christmas party and it was well received. It will be interesting to try this beer again next year after Dave has had time to get used to his system and dial things in a bit. Certainly a nice start for a small brewery and a beer worth trying. Check out SoMe’s Facebook page for their hours and take a trip to York. Brewers Description: A light, sweet, spiced holiday ale.